• The built-in LED driver, timer and charge controller are harmonically combined and protected in one fully encapsulated housing (IP68), increasing system reliability, lifetime and lowering investment costs. • An on/off timer combined with an adjustable dimming function renders flexibility extending operation time and furthermore, saves energy. 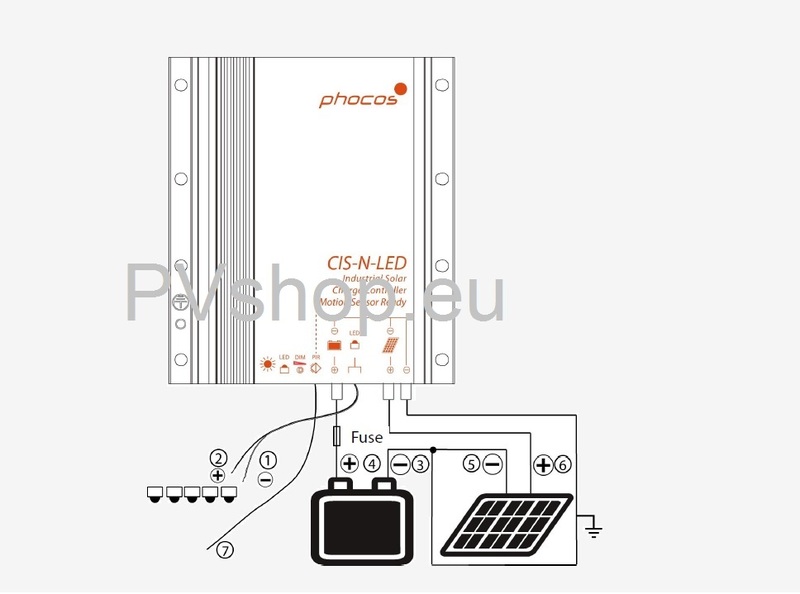 • The CIS-LED also offers an auto-protect function: by means of its two low voltage disconnect levels, the LEDs light will automatically be dimmed when the charge of the battery is getting low. The levels can be programmed by means of remote control CIS-CU. • Dimming-override input. Input for a signal from a motion detector (PIR), will override the dimming function and set the light to full brightness in case a person is detected. In this way, one can set a low dimming level to ensure a minimum light level, enough for a safe orientation, also saving energy. When motion is detected, the light is switched to 100%. The activation time is set on the external motion detector. CISCOM configuration software for CIS-controllers, quick and easy configuration of individual load-time and system components. The CISCOM requires the MXI-IR interface for communication between PC and the CIS-controller. The numbers within the diagrams stand for sequences of connecting the PV components. * Depends on version. The max current appears as panel/generator (Isc). ** In 12/24V battery systems. The max voltage appears as panel/generator (Voc). Infrared remote controller CIS-CU available optionally. Infrared PC/CIS communication interface MXI-IR available optionally. Setting software CISCOM + MXI-IR driver free available.